WHEN YOU CAN OWN THE COMPANY! True ownership of one share of Ford stock framed like you want. The recipient becomes a real shareholder of the company. Purchase your own share of history. Few companies are as closely identified with the history and development of industry and society as Ford Motor Company. Plus, they make awesome cars & trucks. 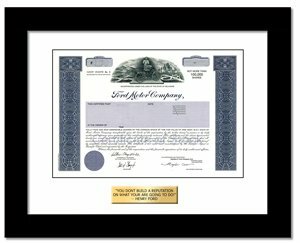 The Ford stock certificate is strikingly ornate. It represents a snapshot of history incorporating the company's name, logo, corporate seal, and printed signatures of corporate officers. Get yours while you can because in the not too distant future, the industry will eliminate physical stock certificates making these valuable collectibles. Ford Motor Company is a global automobile company that designs, develops, manufactures, sells and services cars, trucks and service parts. The company produces vehicles under many different brand names including Ford, Mercury, Lincoln, and Volvo. The Ford Motor Company also owns Hertz Car Rental.